City officials announced Mr Loehmann's sacking and a 10-day suspension for his partner at the scene, Frank Garmback. The penalties come more than a year after a grand jury declined to indict them in the boy's death. An investigation found the officers had not violated procedures but also uncovered details which led to Mr Loehmann's dismissal. He had been allowed to resign from another police department instead of being sacked for being emotionally unstable. But he did not disclose the full circumstances when applying to join the Cleveland police force. "Patrol Officer Loehmann had been charged with rule violations concerning his application... specifically answers he had provided on his personal history statement," Cleveland's Director of Public Safety, Michael McGrath, said at a press conference. The other officer, Frank Garmback, was assigned extra tactical training in addition to his suspension. Tamir Rice had been playing with the pellet gun in a park on 22 November, when a police cruiser pulled up close by. Rookie patrolman Loehmann jumped out and fired his service weapon twice. Tamir Rice died the next day. The shooting was one of several involving police and unarmed black males, which led to mass protests across the US. 22 November, 2014: Tamir Rice is shot and killed in Cleveland. 4 April, 2015: Walter Scott is shot in the back five times by a white police officer, who is fired and later admits violating Mr Scott's civil rights. in a plea deal. 12 April 2015: Freddie Gray is arrested in Baltimore, immobilised, but not safely secured with a seat belt. He suffers spinal injuries while in police custody, and is denied medical assistance he requested. He dies a week later. Why do US police keep killing black men? Mr Loehmann was still in his six-month probationary period when the shooting happened. His dismissal is effective immediately, officers said. 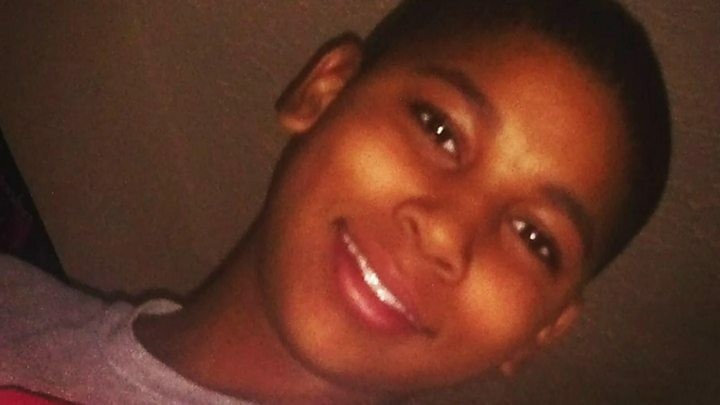 In April 2016, the city agreed to pay $6m (£4.14m) to the family of Tamir Rice. The settlement carried no admissions of any wrongdoing. Samaria Rice, Tamir's mother, told WKYC television she was "relieved" that the officer had been sacked but did not agree with the reasons. "They fired him for lying on his application, which I wish they would've fired him for killing Tamir," she said. "We still need accountability… he should have never been an officer in the first place." "This has been tough on our entire community," Cleveland police chief Calvin Williams said. He said the police department had changed its training and policies as a result, and that the use of deadly force had fallen.